Would you give up the freedom of flight for the ability to eviscerate an adult human with a single kick? The cassowary did, so humans beware. No joke. These birds were ranked in 2004 by the Guiness Book of World Records as one of the most deadly birds in planet, especially to zookeepers. They get to be upwards of six feet tall and can disembowel a human with a single kick, bringing their 5 inch talons to bear. Don't believe me? Here's one in action. To avoid cassowary attacks, steer clear of Australia, New ZealandGuinea, and zoos keeping them. If you do encounter a cassowary, don't provoke it (especially by telling them that their horn looks like a rotten toe nail--they hate that). If in the end you still find yourself being charged by a cassowary, make sure you carry around a large metal shield with you. And have 911 on speed dial. Thanks for reminding us of the cassowary, Carl. Great comic. Yes, never bring a kiwi to a cassowary fight. 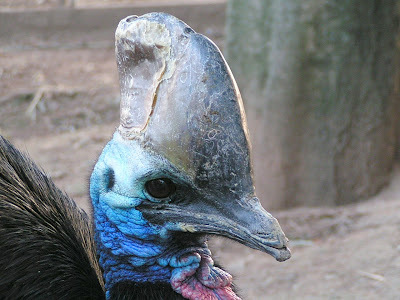 There's more on cassowaries over at Free Documentaries Online for those that are interested. "steer clear of Australia, New Zealand, and zoos keeping them." "there aren't any cassowarys here in New Zealand. " Wombat, you probably meant New Guinea. There are three extant species of cassowaries, all of them found in New Guinea. The one pictured there is the southern cassowary (Casuarius casuarius), which is the only one found in Australia. If a cassowary insisted that you sell it a ticket to New Zealand, would you really want to turn it down?